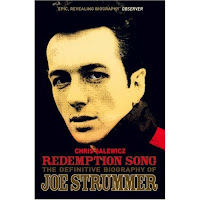 A posthumous biography of the Clash front man Joe Strummer (after whom my eldest is named, sort of) is detailed and passionate, but says very little about the actual music. The human tragedy running through the whole story is that of the relationship between Strummer and Mick Jones. They're like a couple that got married too young, had a wild few years, split up, but never fell out of love for one another. If you care about the The Clash, and if you get to the end of this long book, then you must do, then the tale at the very end about how Mick and Joe finally appeared on stage together, will bring a lump to your throat. When you read that it was five weeks before Joe's death, there'll be tears in your eyes. Cover version update: Joe Strummer and Johnny Cash did Bob Marley's Redemption song. You can't get it on iTunes, but there's a clip on You Tube, here.